Owning your own boat has advantages. You can use it when you want and how you want. And if it’s bay scallop season on our Natural North Florida Gulf coast, you can launch it at St. Marks, Keaton Beach, Steinhatchee, Horseshoe Beach, Suwannee or Cedar Key and make the run to the “scallop grounds”. But owning your own boat has some definite disadvantages, especially if you only scallop during the 3 month season. Remember–a boat is a “hole in the water in which you put money”! Boats that are not used regularly are sometimes unreliable, as are boat trailers and towing gear. Safety gear like flares needs to be replaced regularly and boat licenses and boat ramp fees pile up quickly. So…why not take the “easy way out” and rent a fully rigged and ready rental boat on your next trip to Steinhatchee , which seems to be the 2016 epicenter of bay scalloping. 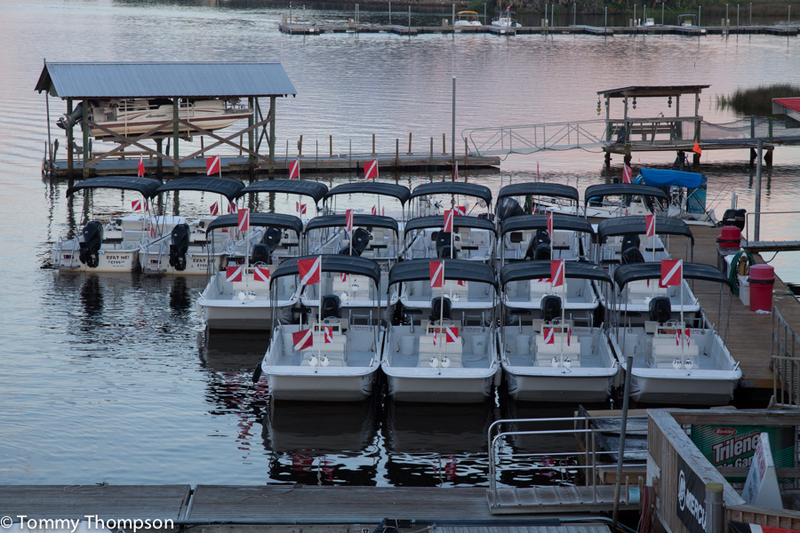 The Sea Hag Marina‘s comfortable and well-kept Carolina Skiffs are fully equipped for scalloping, with boarding ladders and dive flags. All you need to bring is a spare cooler, your fishing license, snorkeling gear (mask, fins and snorkel) and sunscreen. The boats even have big Bimini tops to help with keeping you and your crew cool and out of the sun. In addition to the boats at the Sea Hag Marina, rental boats are also available in Steinhatchee at River Haven Marina, Good Times Marina and Ideal Marina.